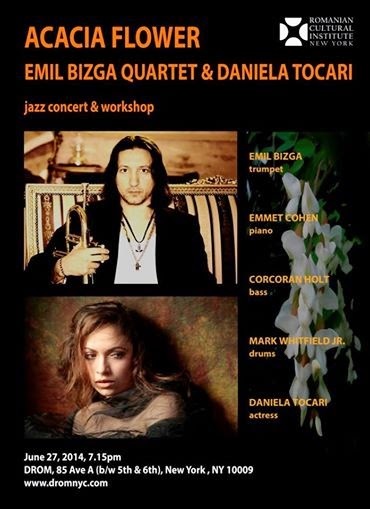 The Romanian Cultural Institute NY had the pleasure to invite us to the jazz & poetry concert “Acacia Flower”, performed by Emil Bizga Quartet and Daniela Tocari .They recived amazing support by a many important and successful people who had a great time at this unique concert! Emil Bizga was born in Iasi, to a family of musicians. His style has been shaped by a broad array of experiences spanning classical orchestra, big band and the jazz combo. In addition to receiving Masters Degrees in classical trumpet in Malmo, Sweden and jazz trumpet in Hanover, Germany, he has worked closely with greats such as Hakan Hardenberger and Wynton Marsalis to further refine his style.